Duxford is, by area space alone, the largest outpost of the Imperial War Museum (IWM) in London. 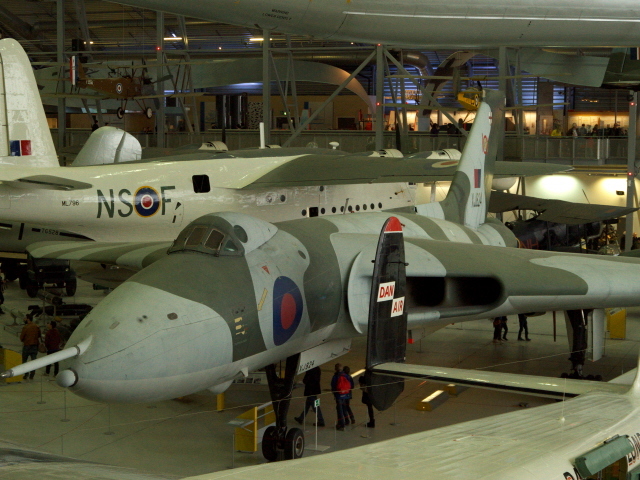 It is located just south of Cambridge, England, and is regarded by many as the best aviation museum in Britain. And what makes it a dark-tourism destination? Well, apart from the sections about the Battle of Britain, the “Blitz” and WWII in general, it is in particular due to the new American Air Museum, which includes lots of remarkable Cold-War-related exhibits and other bits that are most definitely dark – even though the museum as a whole is more a general celebration of the history of aviation. 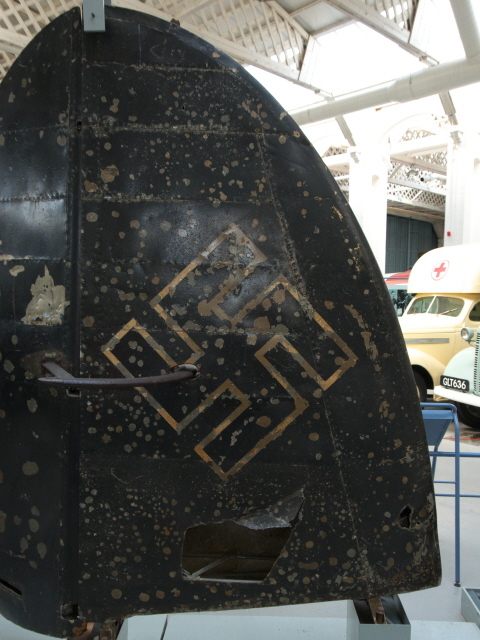 More background info: See also under Imperial War Museum, London; and cf. 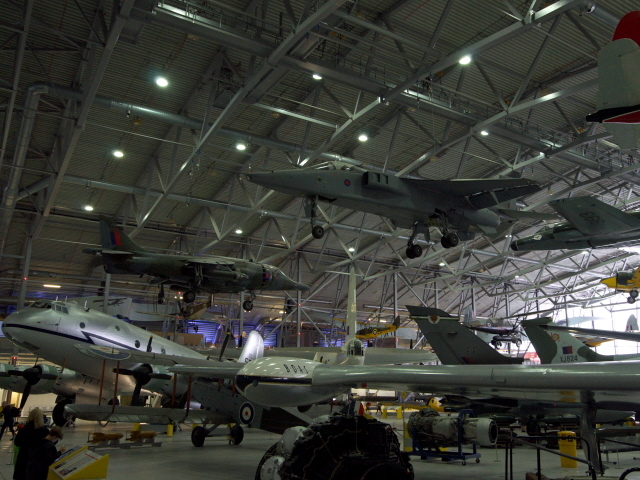 RAF Cosford. The airfield at Duxford dates back to the First World War. It later played a crucial role in the Battle of Britain and WWII generally (also for the USAF), and remained an active airfield for the RAF until 1961. 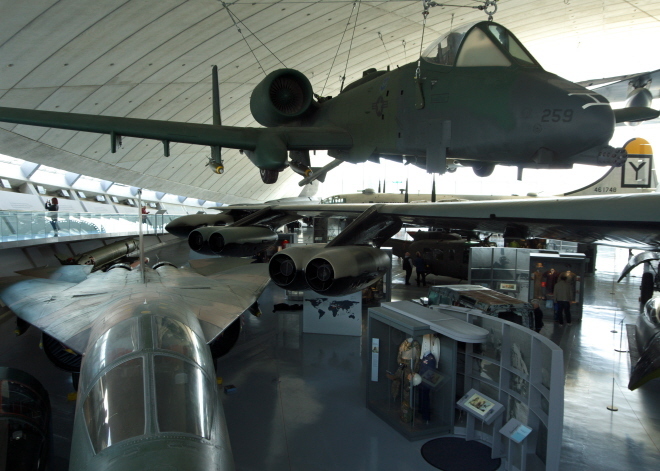 The Imperial War Museum first used parts of the decommissioned structures at Duxford for storage from 1969. In 1976 the whole site was handed over to the museum, and the first incarnation of the museum branch at Duxford opened in 1977. Since then the collection has grown to ca. 200 aircraft from all periods, housed in several hangars, each with a different theme. The latest upgrade came with the reopening of the revamped American Air Museum in March 2016. It is housed in an award-winning purpose-built structure by star architect Sir Norman Foster. Several other buildings, on the other hand, are original and listed as historic buildings, including some of the Battle-of-Britain-era hangars and a 1940s operations room. What there is to see: Plenty – lots and lots of planes, of course, but much more than that. Some parts are more relevant to the dark tourist than others, and even those alone take time to take it all in. Closest to the ticket counter in the visitor centre/museum shop is the so-called Air Space Hangar, which is thus a natural starting point for a visit to Duxford. Here the focus is on celebrating especially the British (and Commonwealth) contribution to the history of aviation, both civil and military. On the gallery surrounding the main cavernous space with the parked planes are various displays and hands-on exhibits about the physics of flight and related topics. On the other side of the hangar is also a Resource Room with computer terminals – but I didn't see anybody in there when I visited. It clearly is difficult to drag yourself away from the big machines that are in the centre of it all here. 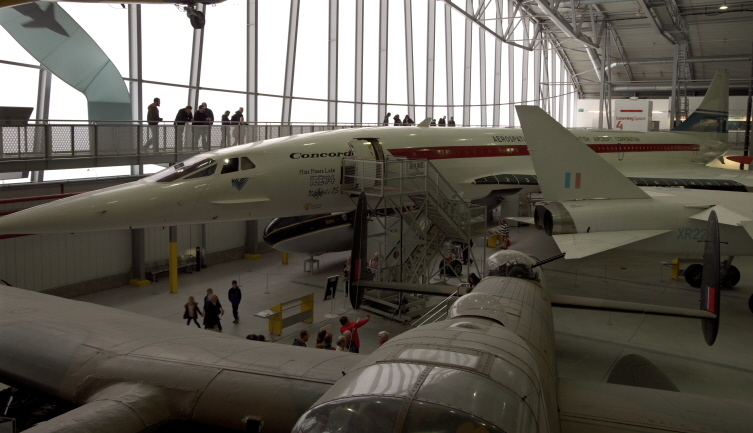 One of the star exhibits here is Concorde, namely a pre-production version (No. 101) used in the flight trials (during one of which it achieved the highest speed of any Concorde ever). You can go inside and peek into the cockpit. 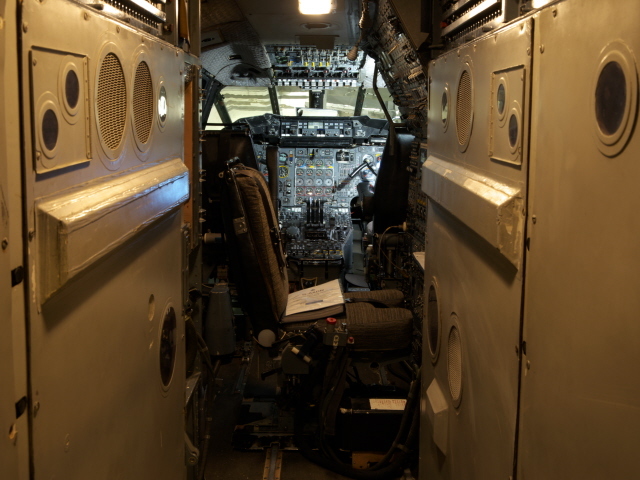 In the cabin, there are only a few rows of seats, the rest was filled with test equipment, of which most has been removed. Text-and-photo-and-diagram panels tell the story of the development of Concorde and the technical details of its design are amply illustrated. Concorde's eventual retirement in 2003 is also briefly illustrated – but the principal reason leading to its retirement is not especially pointed out: the tragic crash of a Concorde in Paris in July 2000, when a ruptured fuel tank on the plane caught fire during take-off and the plane crashed into a hotel, killing all 109 on board and four on the ground. It was the only Concorde ever to crash, but it spelled the end of its flying career. As Jeremy Clarkson put it (in his very own style): it was a case of not just being shocked because of the human casualties but “we were actually mourning the loss of the machine itself” (in the book “I Know You Got Soul”, p 13). The tragic end of Concorde could have been covered better at Duxford. Another rather sad star in the Air Space Hangar is the TSR-2 prototype on display, one of only two to survive (the other, even more complete one, is at RAF Cosford). This ambitious British supersonic strike aircraft project, however, was shelved in 1965 due to its costs spiralling out of control. Next is a Vulcan V-Force bomber. This British strategic bomber of iconic delta-wing design (dating back to the 1950s) was once the backbone of the UK's nuclear deterrent. However, it had its very own finest hour in operation in a conventional mission (its only combat mission ever, in fact), namely in 1982 in the Black Buck raids during the Falklands War. The Vulcan with its odd shape has a kind-of brooding presence still today. You can't go in, but the bomb bay is open so you can look into that surprisingly cavernous space. 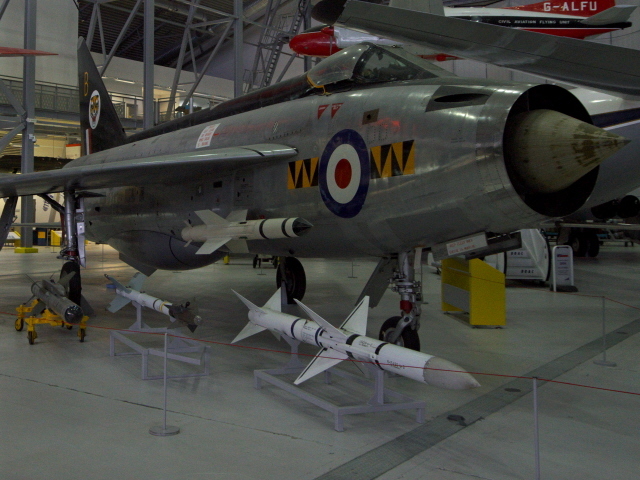 Displayed next to it are a couple of British nuclear weapons, a regular free-fall bomb and the sleek, white, 1.1 megaton warhead, air-launched Blue Steel missile that would have been carried by V bombers (see also RAF Cosford). Other planes worth mentioning here are the English Electric Lightning, a supersonic fighter from the Cold War era, a Jaguar strike jet (another Anglo-French co-production) and the famous Harrier jump jet, also of Falklands War fame. There are plenty of other planes but most of those are of less special interest from a dark perspective. On your way out, however, note the Polaris missile on display by the main door. This type of rocket was once Britain's main nuclear deterrent (before Trident came along) as a submarine-launched ballistic missile (SLBM). It is presumably also the one item that justifies the “Space” part of this exhibition's name. Air Space is only one of a total of seven hangars at Duxford, but it's the largest. The second largest is the next one in the row spreading westwards. 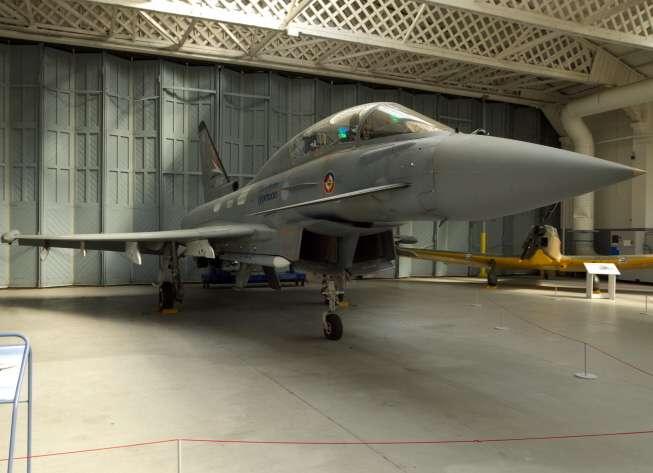 In this hangar, the flying aircraft used in the various air shows are maintained and looked after. One hangar further along is the Air and Sea section (with maritime aircraft), which is also of no special interest to the dark tourist. Just south of this hangar is the airfield's tower. And next to it kids (of all ages and sizes) can go on a “flight simulator” to get an idea of what it was like to be a pilot in the Battle of Britain (if a screen and a moving cabin alone can do that). Also near the tower you can go on real flights in vintage but still airworthy planes. 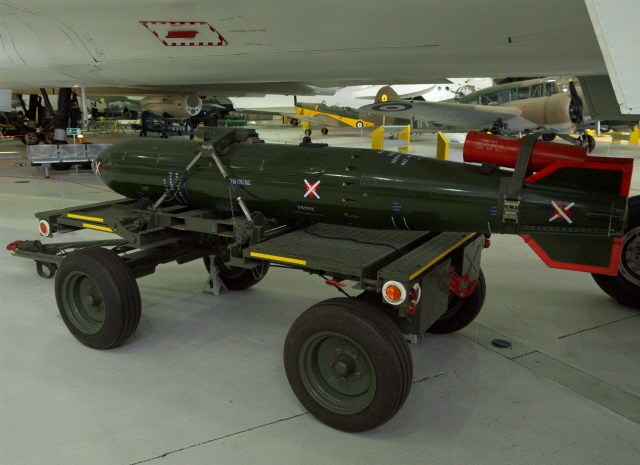 There are further open-air elements at Duxford, from the row of civilian airliners to a V1 on a launching ramp, a Cold-War-era, British-built surface-to-air missile (SAM) and a gigantic cannon that looks like it must have come from some coastal gun battery. Contrasting with this obviously antique exhibit is the American Air Museum building next to it. This giant, shell-shaped structure has a glass front facing the airfield's apron, but visitors enter the building from the rear. I had timed my visit well – the revamped American exhibition had just reopened the week before. At least from a dark-tourism perspective, this is definitely the highlight at Duxford! As you walk in you come face to face with a B-52, at cockpit level. This monster of a machine is one of the deadliest planes ever flown – not only has it been the USA's principal nuclear bomber throughout almost the entire Cold War, it was actually most deadly as a conventional bomber, especially in the carpet-bombing of Vietnam. 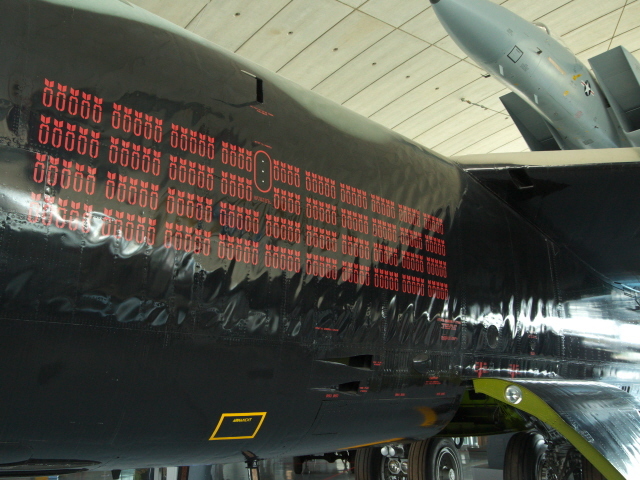 This particular B-52 flew some 200 sorties in the Vietnam War, neatly marked by little red bomb symbols for each one of them painted on the side of the fuselage! 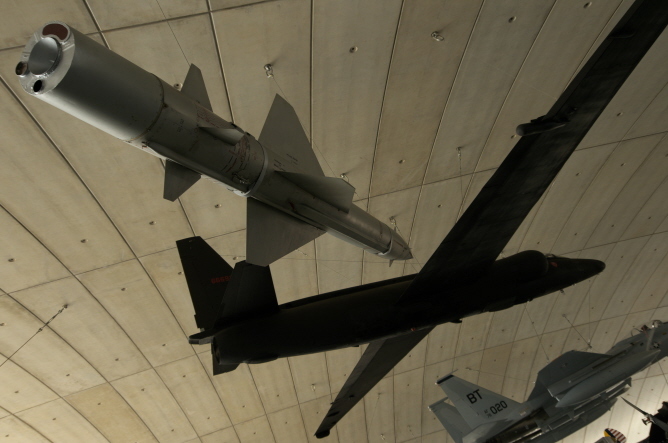 Next to this largest piece on display here are yet more American-made modern air-borne death machines, such as the F111 right next to it or the menacing-looking A-10 ground attack plane hovering from strings from the ceiling above as if on an attack trajectory. Older planes are also on display, including quite a number from WWII, ranging from fighters that gave air support during the D-Day Landings to heavy bombers such as the B-17 and B-29. But it's not all just planes. The topic of the bombing of civilian cities that so characterized WWII is also illustrated dramatically, albeit on a much more subtle level, through the display of a damaged statue salvaged from the rubble of Dresden, Germany. Other non-aircraft displays include glass cabinets filled with various smaller objects. 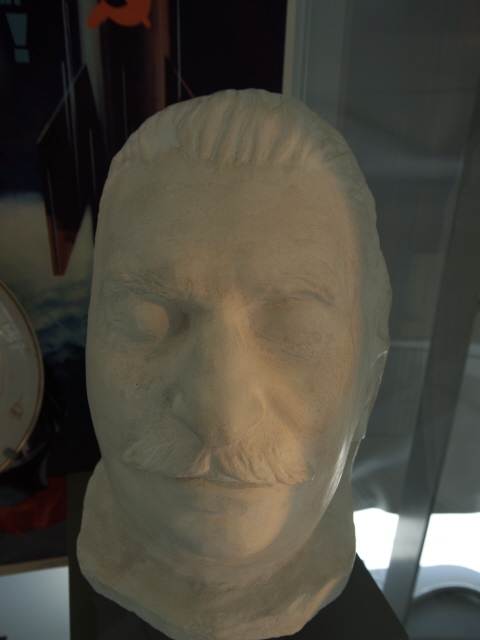 One about the Cold War features a death mask of Josef Stalin! The space race that accompanied the Cold War is illustrated too, for instance, by a Russian ornamental plate featuring the image of Laika, the first dog in space. A key episode of the Cold War, the shooting down of a U2 spy plane over Russia is exemplified not only by a U2 hanging from the ceiling with a Soviet SAM below as if on target, they also have the U2 pilot's flight suit on display. This pilot, Gary Powers, had been captured by the Soviets and was later exchanged for unmasked Soviet spies at the famous Glienicke Bridge in Berlin. A more recently acquired star exhibit here is the SR-71 Blackbird, the spy plane that succeeded (and vastly surpassed) the U2. This plane could not be shot down. It was the highest-flying and fastest jet aircraft ever – and arguably one of the most stunning looking designs ever as well. This can hardly be seen by the weapon that represents the current state of the art: a Tomahawk cruise missile with its launcher vehicle – these may be hi-tech gear, but looks-wise they're nothing much to shout about. 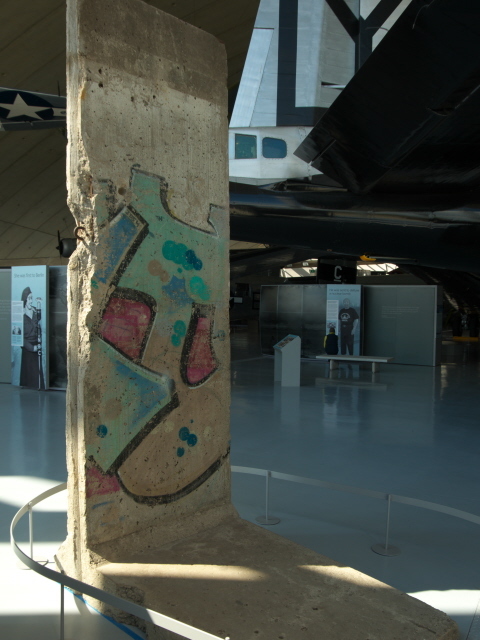 The post-Cold-War era is signalled by a piece of the Berlin Wall. 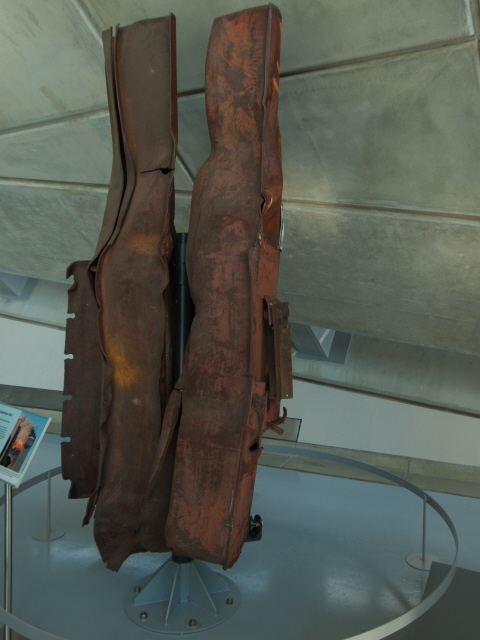 The arrival of the current age of asymmetric warfare and the fight against terrorism is, in turn, signalled by the display of a piece of mangled steel from the WTC in New York that was destroyed in the 9/11 attacks (see also 9/11 Memorial & Museum). 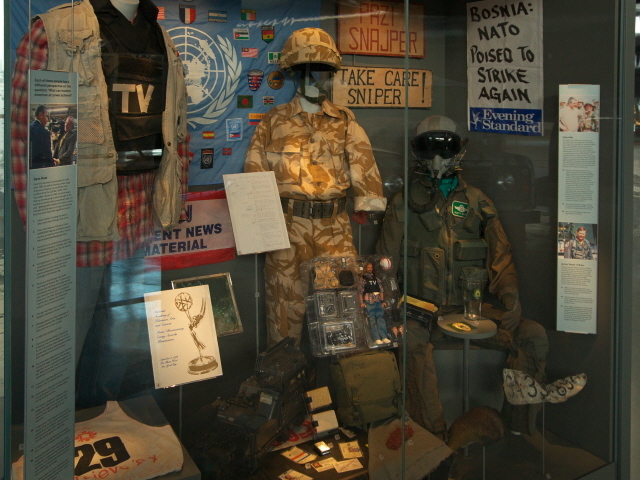 Displays of objects from the Iraq Wars (including the Gulf War's SCUD vs Patriot missiles) and from Afghanistan take us virtually to the present day, as does the creepy display of a suicide bomber's belt of explosives. 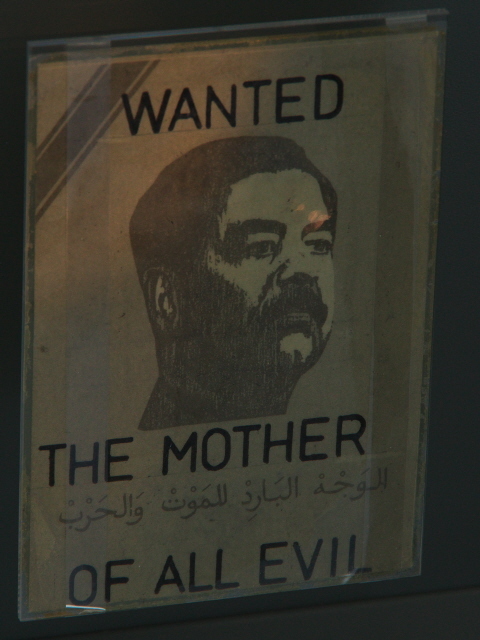 Throughout the exhibition, there's an excellent mix of big vs small items and visually stunning vs. text-heavy ones. Several personal stories are picked out and explained through panels and screens. The lively mix of things thus never gets boring, and also leaves the visitor plenty of freedom to choose what to concentrate on, be it just the planes or all the background info for those who want to dig a bit deeper. Superbly designed exhibition! Back outside you could proceed even further west to the Land Warfare museum building. Displayed here are, as the name implies, mostly tanks and other military vehicles of war on the ground. Partly because I find tanks comparatively boring, and in the context of an aviation museum also off topic, and partly because I was under time pressure (I had to get back for my flight from Heathrow the same day) I did not bother with this part of Duxford. So cannot say any more about it. 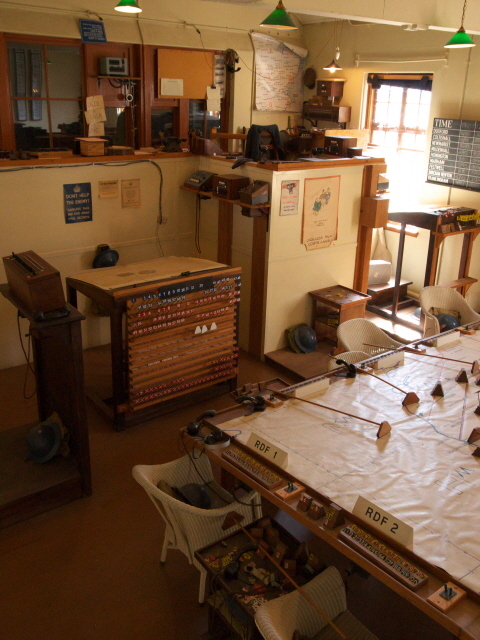 I did, however, visit the parts of the historic air base that are open to the public, in particular the preserved 1940s operations room, from where Duxford's fighter planes would have been co-ordinated back then. This is possibly the place with the heaviest air of history. The remaining two hangars house the Conservation in Action and the Battle of Britain sections. 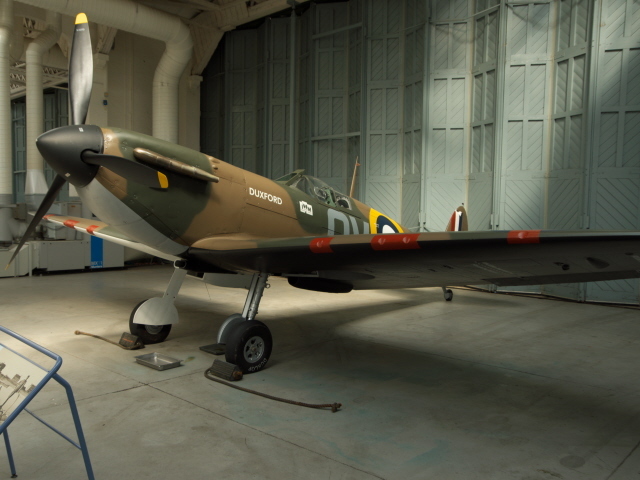 The latter features some of the usual suspects, in particular the famous Spitfire, the aviation star of what is often considered “Britain's Finest Hour” of WWII (after a famous Winston Churchill speech). The other British fighter plane, the Hawker Hurricane, is also represented, complete with a very Tommy-cliche-like dummy pilot giving a thumbs-up. The main German opponent is to be seen here too, the Messerschmitt Bf-109 fighter, represented by an original plane that was forced to crash-land on British soil during the battle. The story of the Battle of Britain is also told through texts, photos and installations of land-based things like observation posts and ambulance vehicles. 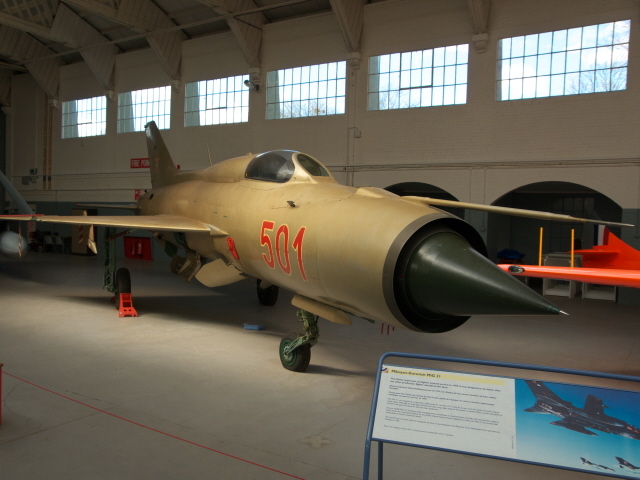 In the back of the same hangar, there were more modern planes complementing the historical veterans, including a gold-painted MiG-21 and a specimen of the current pride of the RAF's fighter fleet, the Eurofighter Typhoon. 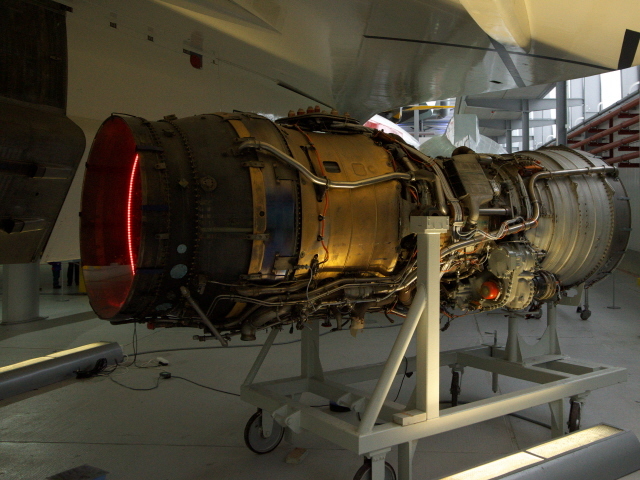 In the conservation hangar you can watch engineers doing their restoration and repair work on whatever planes have been brought in for this, so what you see will always vary. 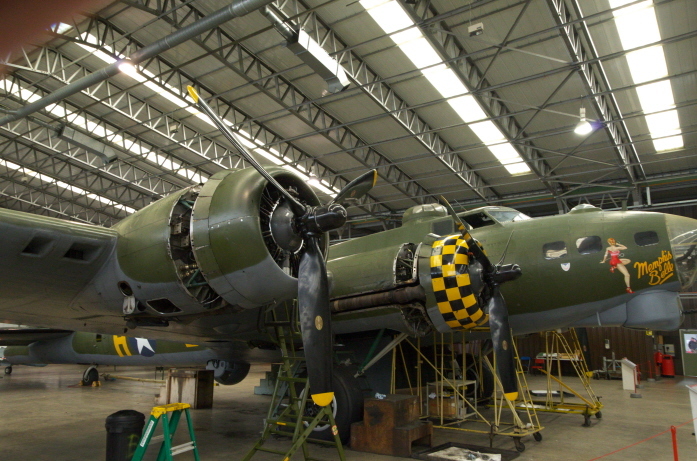 Some planes looked like they still needed a lot of TLC and work, while others appeared to be in perfect shape, including one of the other stars of Duxford: the B-17 flying fortress bomber called “Sally B”, apparently the only airworthy B-17 in Europe. Predictably the museum also has a huge shop, offering everything from big tomes on aviation and war history to model kits and from T-shirts to jewellery that incorporates genuine poppies. And since the area is so huge and visits take so long, there are naturally also several food outlets at the site. Overall, it is obvious enough that this type of museum won't be for everybody. For aircraft enthusiasts it will be outstanding, but for others it may well be of rather limited appeal. For the dark tourist a somewhat selective approach is to be recommended. But especially the American Air Museum has loads to offer to anyone with that special perspective in mind. To a much lesser degree this is also true of the Air Space part, but the rest is really just for plane lovers and (mainly British) war history buffs. Location: ten miles (16 km) south of Cambridge, England, Great Britain, and ca. 50 miles (75 km) north of London. Access and costs: easy to get to by car, not cheap (though not excessively priced either, for what you get). Details: Duxford is best reached by car – it is just off junction 10 on the M11 south of Cambridge, and there is plenty of free parking. From the west, it is also easily reached via the A505. It's well signposted. Public transport, on the other hand, is quite limited. A bus to Duxford from Cambridge operates only on Sundays. Train services are more frequent but do not go to Duxford itself. The nearest station is at Whittlesford, which is a good half an hour's walk away (crossing a motorway junction) and the station does not have a taxi rank (but if you're staying at the hotel right behind this station, they could certainly organize one). Alternatively you could get a train to either Cambridge or Royston, and get a taxi from there (where taxis are easily available). Opening times: daily, including bank holidays (closed only over Christmas) from 10 a.m. to 6 p.m. in summer (mid-March to late October), to 4 p.m. only in winter. On air show days the museum opens its doors earlier (from 8 a.m.), but crowds and traffic will cause delays. Admission: regular adult tickets cost 18 GBP, including a donation of 10% (so the museum can claim Gift Aid if you are a UK taxpayer … so if you're not you can just as well pay only the ticket price: 16.35 GBP); concession (students, disabled, senior, unemployed): 14.40 GBP; children between 5 and 15 years old: 9 GBP. For only five pounds extra you can upgrade to an annual pass valid for unlimited visits, except for air shows. For air shows you have to obtain advance purchase tickets (through the iwm.org.uk website) – access will be denied if you don't have a ticket. Ticket prices range from ca. 30 GBP for a regular ticket to up to 200 GBP for a “gold” ticket for premium seats (and including lunch). Holders of regular tickets have to factor in extra costs for parking, enclosed seating, and purchase of a programme. There are different types of air shows, usually stretched over two or three days. In addition to special anniversary shows, the regularly (at least annually) held events include the Flying Legends Air Show (of veteran planes only) and the general Duxford Air Show (which also includes modern jets). Time required: lots! A whole day is easily filled, especially for aircraft enthusiasts. Some even return on a regular basis. For just seeing the dark bits highlighted here (especially in the American Air Museum), as little as two to three hours might suffice, but it would be a shame not to also take in at least some of the not-so-dark attractions (e.g. the civilian airliners). Combinations with other dark destinations: The home base of the Imperial War Museum in London is certainly the most obvious combination, as are the other branches of this institution, especially the Churchill War Rooms and IWM North. Geographically the nearest combinable other dark attraction is the Kelvedon Hatch Secret Nuclear Bunker, which is located just north-east of the M25 and is quickly reached from Duxford via the M11. A similar distance away to the west (but along slower roads) is Bletchley Park, famous for breaking the German Enigma machine code in WWII and for being the birth place of the computer age. 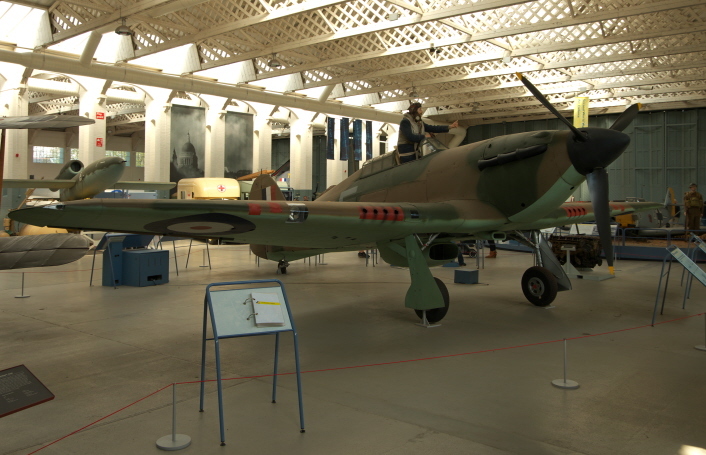 And if you liked Duxford you may also want to visit some of the other aviation museums in Britain, first and foremost the Royal Air Force Museum at RAF Cosford, a good 20 miles (35 km) north-west of Birmingham. This is also home to the National Cold War Exhibition. 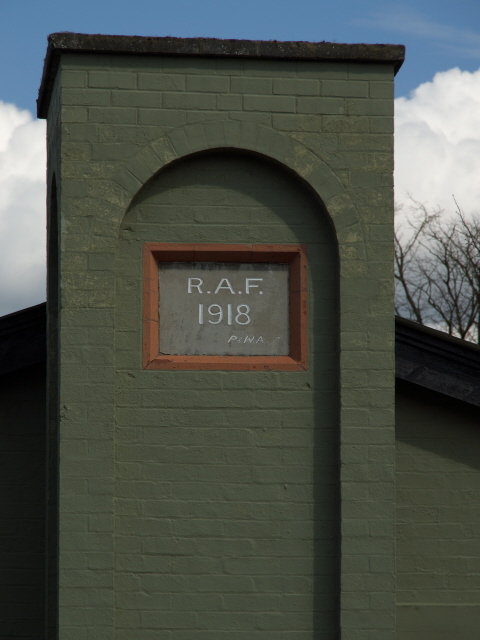 Another branch of the RAF Museum is located on the northern edge of London at Hendon. Furthermore, the Fleet Air Arm Museum at the Royal Naval Station Yeovilton in Somerset is worth a mention too (they too have a Concorde plus various Navy aircraft, including some from the Falklands War). For yet more see also under Great Britain in general. Combinations with non-dark destinations: Cambridge with its world-famous university's college buildings is the closest tourism attraction to Duxford – just 10 miles (16 km) to the north. London, ca. 50 miles (80 km) to the south is also within fairly easy reach, as is the rest of central south-east England.